The size distribution of organisms in a lake facilitates robust conclusions to be drawn on the energy efficiency in the food web, as researchers from the Leibniz-Institute of Freshwater Ecology and Inland Fisheries (IGB) and international colleagues have now demonstrated empirically. This relationship enables scientists to gain a better and more direct understanding of biological processes and disturbances that impact aquatic ecosystems. Any single habitat is only able to accommodate a certain number of large organisms because these must feed on smaller creatures. In ecology, this connection is described by the trophic transfer efficiency (TTE): around ninety per cent of energy is lost from one level of the food chain to the next or, in other words, only ten per cent remain. If, for example, a bird of prey devours a rabbit, it can use only ten per cent of the energy, which the rabbit needed to grow and live, to increase its own weight – most of the energy, then, is lost. IGB researchers have now examined how large this important model parameter actually is in natural lake ecosystems, and how it relates to the population density of organisms of different size groups. "Of course, investigations have already been carried out into the trophic transfer efficiency and size distribution, but they were on a smaller scale than our study: we analysed all trophic levels, from bacteria to large fish," states Dr. Thomas Mehner, lead author of the study and head of the Food Web Ecology and Fish Communities Research Group at IGB. 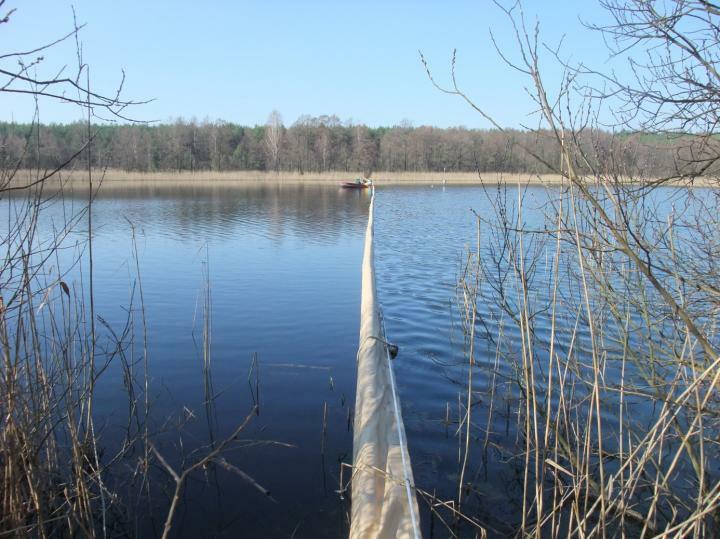 The researchers' study involved investigating food webs in two small, shallow and nutrient-rich lakes in Northern Germany, each of which divided into two closed systems for a period of one year by installing a curtain through the middle of each lake. The long period of division meant that the key groups of organisms developed differently in both halves, enabling the scientists to collect data for a total of four different aquatic ecosystems. The researchers determined the biomass and size of all organisms present in the lakes. In addition, the team computed the trophic transfer efficiency for all levels of the food chain in the lake. To achieve this, they compared primary and bacterial production with secondary production (i.e. the increase in biomass at the consumer level). "We found out that energy efficiency is lower than is generally assumed: namely, well below ten per cent. In other words, available food is utilised much less efficiently than expected," reports Thomas Mehner. The TTEs determined in all four lake systems were more or less equally low. However, the predictions of the ecological theories with respect to the connection between the TTE and size distribution were confirmed: when the trophic transfer efficiency falls below ten per cent, this corresponds to an increasingly steep declining curve in the model. Consequently, the biomass of the larger organisms also declined more strongly than expected in all four lake halves. For example, the researchers counted considerably fewer consumers in the water than would be expected in the case of a higher TTE. Using size distribution in lakes as a "tool"
The fact that the relationship between the trophic transfer efficiency and size distribution is stable opens up new possibilities concerning the investigation of aquatic ecosystems. Rather than taking great pains to identify the TTE, it presumably suffices to measure population densities and size distributions. "The trophic transfer efficiency is an important parameter, but we often do not know the size of this parameter. We were able to show that the size distribution, which is easier to determine and more commonly applied, might be sufficient for evaluating the energetic state and efficiency of an ecosystem," Mehner summarises the relevance of the findings. As a result, the size distribution can be used as a "tool" for gaining information such as on the impact of global warming, the invasion of alien species, habitat changes or human exploitation of ecosystem functions. What effect does transcranial magnetic stimulation have on the brain? Mom, I can't recognize your face from profile view!